Mukul's digital force and sophistication to face the analog warmth and muscle of Tuomas Toivonen's set-up. The twin soundsystems will begin the performance in silence by turning on their machines and end in an embrace of death... All sound will be produced, programmed and arranged live. Tuomas Toivonen is an architect and a singer / song writer of the Finnish band Giant Robot. 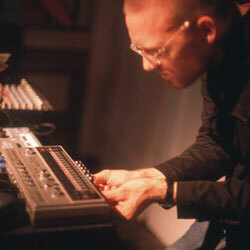 He also has his own sound project Toinen Linja on SÄHKÖ label.